if I keep saying that capital improvements to the existing stadiums plus a streetcar extension would be a better investment than a new stadium, will this make it happen? What about if it could be done before a hypothetical 2028 World Cup? alejandro46 wrote: if I keep saying that capital improvements to the existing stadiums plus a streetcar extension would be a better investment than a new stadium, will this make it happen? What about if it could be done before a hypothetical 2028 World Cup? It will come down to what the team thinks. And they seemed to follow your line of thinking the last time around. However, this time I think the Royals will argue that we've already done that and we've maximized the revenue that can be generated by a stadium located where it is. And I think they have a decent point when it comes to premium seats and corporate boxes. Those would be huge at a downtown stadium. I can't remember where I heard this but it seemed like direct quotes from the royals where they said last time around it was really before the huge (visible) sign of rebirth downtown and they didn't want what was seen as the "savior" of downtown. They are much more interested in being a part of a now revitalized downtown. I know nothing about this, but has anyone approached cordish? It'll take a serious investment from the team and city and third parties. We're getting close to the point where this needs to be discussed for land reasons and future downtown planning. If it's a no, we need to stop banking land. It it's a yes, we should start the process. 1. The Northloop shouldn’t be used IMHO. A stadium at Washington Park area used land owned by the city. Thus the land doesn’t have to be banked nor does it have to be purchased from someone who prevented development in downtown by landbanking. 2. Trying to maximize the revenue sources tied to this stadium will greatly improve its chances of success. That is why I removed the “Game Day Plaza” in my proposal in exchange for hotels,apartments, etc. I am hoping that this would reduce the needs for public funds. Last edited by normalthings on Tue Jun 19, 2018 7:38 pm, edited 1 time in total. All absolutely fair points. Would it be possible to renovate TSC stadiums significantly enough to greatly increase the number of boxes/seats beyond the recent major renov? My train (sorry bad pun) of thought just that maybe voters would be more palatable to a dedicate lane streetcar tied into a larger proposal as it would be something a very under invested part of the community could leverage year round vs. just the optics of giving more handouts to billionaire sports team owners. I've been thinking a lot about the downtown stadium ideas, in particular having it near 18th and Vine. The city's been struggling for years to get that area working and has poured loads of money into promoting it, so they have a vested interest in its success. A stadium would serve as an anchor. 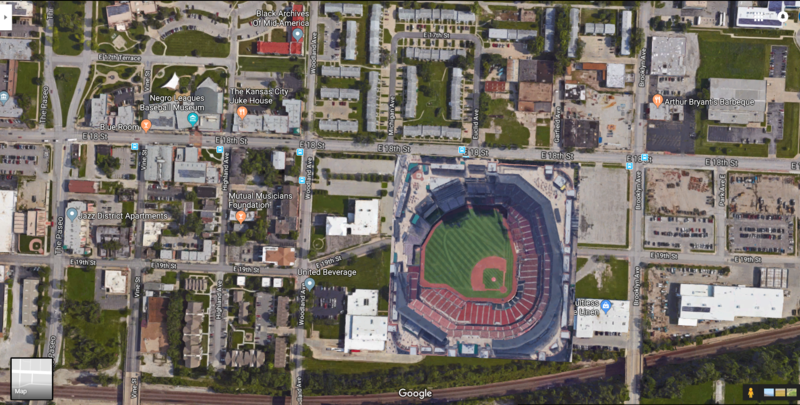 It would also fit in great in context, particularly with the baseball museum right there, and would place it within blocks of municipal stadium's former site. Having something as high profile as a stadium would also help clean up some of the industrial parks dividing the area from the crossroads. It would also be near Arthur Bryant's, which could serve as a big draw for out-of-towners, being a place visited by presidents and such. "World famous" and all that. I have two particular sites in mind. I used St. Louis's Busch stadium as a reference, shown more or less in scale. You forgot space for a parking garage. Parking today easily brings in $7.5 million per year. 1. You better have a much more robust public transportation system in place than now. 2. And, yes, a parking garage. In reality many more than just one. aknowledgeableperson wrote: 1. You better have a much more robust public transportation system in place than now. You also have to think about access points. Those spots aren't bad in terms of space for a stadium and it would be possible to add bus service but 90% of traffic will take the same ramps and streets which are some of the worst designed in the city for adding thousands of cars at once. Going to end up with thousands of cars on The Paseo and 18th all at once. It would take hours for traffic to clear from this spot. It's why one of the few good spots downtown is near Indep Ave and the Paseo. There are plenty of places surrounding each site that could hold a parking garage. I just didn't include it because I thought of it as a given and didn't think it would be particularly interesting to show. Sight One works for me but Site 2 is a big no. Site 2 offers no critical mass or development opportunities that connect downtown and the Jazz District. It is too disparate from everything other than 71. Outside of it being somewhat close to 71, there are literally 30+ empty sites throughout the city that would offer the same lack of critical mass. Put it in the loop and take advantage of existing parking assets. Why saddle the public with another concrete debt monster? Better transit access, too. East Village? IMO that is the only possible location inside the loop. East Village is never going to happen. If it was even 20% viable as a location for mixed use someone would have jumped on it by now. 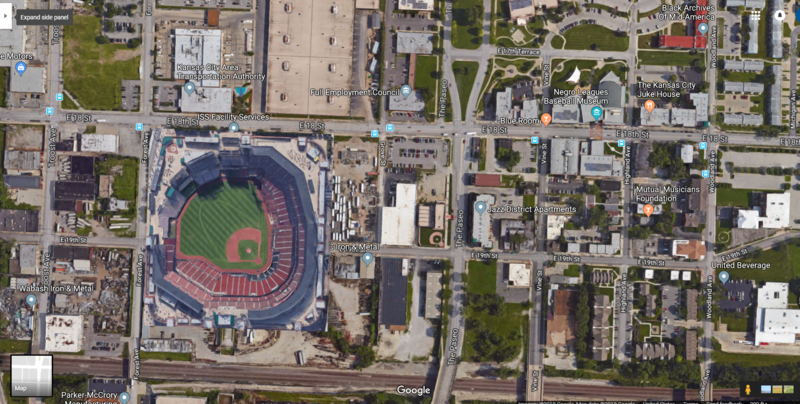 Put the stadium on the extreme east loop next to 71. You have I-70, 71 and 670 there. Perhaps some apartment towers might be built if you put the stadium there. The north loop will eventually happen and I'd like to see the I-70 trench gone eventually and the streets restored. A stadium there will eventually keep the highway in place as people will complain they need it for stadium access. Put the stadium at a spot like SW corner Indep Ave and Paseo or south of 18th and Vine. Near to downtown but not on top of it. Both spots won't break the long distance grid, all streets involved end near to the point they would be cut and the areas are prime redevelopment spots. Include in the exact the same voter approval a fully funded streetcar line that reaches the new stadium from Main and use all the parking along the line. You also would have every rider able to hop off on the way back at any restaurant they pass instead of the nothing at the current stadium vs immediatelly driving home. It's about a mile of track to either site which would add around 10% to the total cost. I like the 18th and Vine ideas more overall in this model. 18th St track would be a transfer point for Troost Max to the streetcar. Thought maybe I'd start a pro/con list as this discussion continues. -New facilities that all fans can enjoy. -Extremely expensive to build new stadium ($450m estimate a decade ago). -Good highway connectivity to TSC, downtown less so; but also TSC cut off from rest of city and only access is via personal car, bus, Uber. - Will likely need additional investments in even more parking. -Not a great use of real estate (a stadium would only be filled with people 81 times a year for 3-5 hours, leaving a massive empty stadium for 284 dates). -Generally, downtown & urban core development is strong, save a few obvious exceptions in E. Village, 18th and vine area - not clear that this is really needed or the best way to spur development. - Negative public opinion regarding public financing of stadiums. Dubious ROI for city. alejandro46 wrote: -Not a great use of real estate (a stadium would only be filled with people 81 times a year for 3-5 hours, leaving a massive empty stadium for 284 dates). I disagree on higher attendance. DT only has 20-40k residents, depending on how you draw the line. So you would be putting a stadium in a low-density area with poor automotive access, relatively speaking. And yes, TSC is in a VERY low population area. But isn't all of KC low-density population? So since you can't build it where there are people you have to make it easy to get to. It's easy to get to where it's at. I was strongly for a downtown stadium 10+ years ago as a way to strengthen downtown but have since realized a strong downtown shouldn't be mostly based on events and downtown already has a healthy variety of venues. While I wouldn't be entirely against a downtown stadium, more hotels/residents/offices would be a better use of space. The TSC location is poor though.